Thomas Kinkade and Christianity- What do we learn from “The Painter of Light”? | J.W. Wartick -"Always Have a Reason"
Thomas Kinkade and Christianity- What do we learn from “The Painter of Light”? A favorite of Kinkade’s works. Thomas Kinkade is a polarizing figure. His art is beloved and hated. Some see the art as picturesque and hearkening back to a simpler time. Others see his art as gaudy and outlandish with terrible lighting effect. Whatever your own view, it must be admitted that an artist with paintings in thousands upon thousands of homes is vastly more influential than most. Here, we will examine Thomas Kinkade’s art from a few different angles. The image featured in this post, “Sunday Evening Sleigh Ride,” exhibits a number of features of Kinkade’s art. Light is featured prominently. It is used in a kind of spiritual fashion–its warmth beckons from the church to the cold, snow-covered land around it. The viewer’s attention is not upon the sleigh itself, because the light is centered upon the place of worship: the church. Note also the fish symbol displayed above Kinkade’s signature. The image is one of familiarity–particularly for those who are most assuredly Kinkade’s audience: broadly mainstream protestants. There is something to be had in the image for different parts of the country. The mountains could place it in the winter of Colorado, but the feel of chill found in the image reminds me, at least, of the Midwest. The Northeast may reflect upon their love for sleigh rides. The uniting theme, of course, is found in the call to the church as found in the image. Others who are better equipped for critique of art have noticed these themes in Kinkade’s work as well. I have been reading through Thomas Kinkade: The Artist in the Mall. The book analyzes Kinkade’s work from a number of angles. Some of the contributors enjoyed his work–or at least appreciated it as art. Others dismissed it as clearly obscene or hideous. One undercurrent in many of the essays was the notion of Kinkade’s professed religious values and how those may come out in his art. One of the essays actually seemed to accuse Kinkade of specifically exploiting foolish middle-class Protestants through the use of pseudo-religion to cause them to open their wallets and spend money on his works. Another explored the way in which Kinkade consciously displayed light and other features in his artwork to convey a message he clearly conceived of as evangelical, while also appealing to a kind of picturesque, idealistic view of Christian culture (45ff, cited below). The artist viewed nature as imbued with God’s beauty revealed, and felt he should paint it as such (46). In my opinion, the least flattering image portrayed of Kinkade was the essay entitled “The Painter of the Right.” In this essay, Micki McElya basically paints Kinkade’s project as one of glorifying a kind of civil religion of American Christianity (see especially p.73, 76 cited below). There is clearly a broad spectrum of views as to the project Kinkade pursued through his life. The fact that he plastered his art over coffee mugs, blankets, ornaments, and anything else an image could be placed upon might strike the more cynical as truly an exploitation of the foolish religious masses with money to spend. However, one must wonder whether the sincerity of one’s professed religious beliefs must be reevaluated in light of consumer success. Of course, one might also suggest that Kinkade’s public failings regarding his marriage and alcohol may be grounds for doubting his religious affectation. But again, this would be to act in a fairly Pharisaic manner–to condemn another saint who remains yet a sinner while one is the same. Regardless, it seems there is much to perhaps learn about and from Kinkade, as ridiculous as that may sound to some. Returning to the art itself, there is little doubt that Kinkade masterfully pursued his project of attempting to subtly evangelize through his art. The image I selected is more obvious than most, but the themes of light and other religious imagery may be found throughout his body of work. Perhaps one may see these as the marks of a man’s dedication to trying to use his skills most fully in the best way he knew how to adhere to his faith. Perhaps not. I tend to favor the former rather than the latter. Although I realize some of the criticisms of his art may be on-point, I cannot help but be drawn in by his art. I don’t enjoy all of it, but “Sunday Evening Sleigh Ride” is one I particularly do enjoy. I realize it is constructed in such a way as to tug at my heart–I am most certainly part of Kinkade’s target audience–but that does not, in itself, belittle the art’s value. Nor does Kinkade’s own life, which stirred some controversy towards the end, destroy the possibility for his true belief. I’m keen to give people the benefit of the doubt, and I think that Kinkade’s did little to mar his own image as the “Painter of Light.” It is possible to be a sinner-saint, as are all the redeemed in this life. Kinkade’s art may not be your cup of tea, but it should be of interest to see how someone may integrate their faith into their life. Alexis L. Boylan, Editor, Thomas Kinkade: The Artist in the Mall (Duke University Press, 2011). 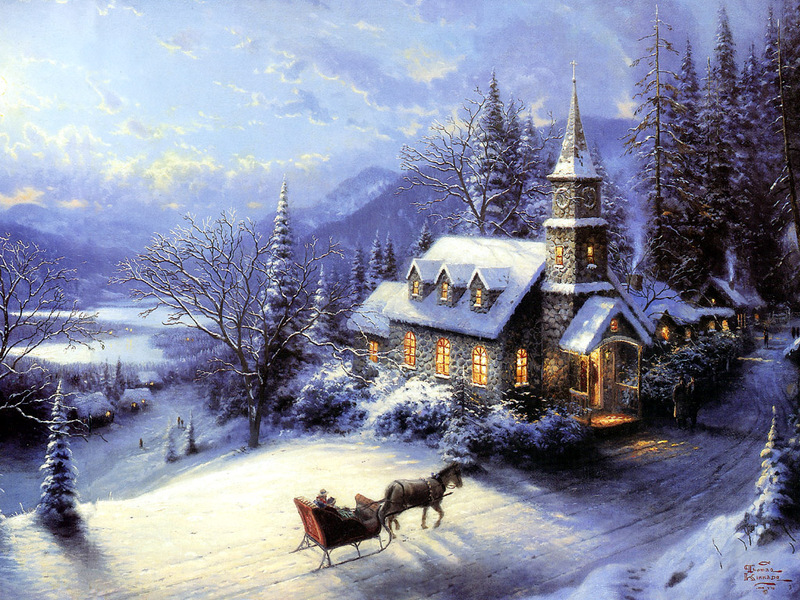 The image is copyright Thomas Kinkade and I do not claim any credit for it. I am using it under fair use as a critical examination of the artwork. Be sure to check out Thomas Kinkade’s website if you would like to browse his art and purchase it in various forms. « Sunday Quote!- Using Genealogies for the Age of the Earth? I have always been hypnotized by the light effects in Kinkade’s paintings. Each time I walked up to one I would think to myself, if only for a brief second, “I could do that…it’s only paint.” Then reality would wake me out of my delusions…all it would take was one look at the price tag and then I’d remember who had the talent and who didn’t. Some of the critics you quoted did sound over the top and like they were just searching for something to demean. Seriously, how many artists would love to make a living from their work? How many actually find their niche? It’s easy for them to find fault, but how many of their paintings were in the mall? Thanks for stopping by! Yes, Anthony, I agree with much of what you said. Entering the world of art criticism is a scary endeavor for sure, and there is a lot of snobbery over what counts as art and whether Kinkade’s style (in particular) is too “gaudy” and the like. But I think one really has to wonder what the point of art is, then. If Kinkade’s art impacts those who view it in meaningful ways–and surely no one can deny that it does–then can someone seriously come along and say it’s not even art? I do not think so. Nevertheless, many do. The book was actually really interesting and well worth the read. It ranged from crazy to quite enjoyable. A very diverse set of views and analyses. I’ve always enjoyed Kinkade’s art–though not all of it–and I do think his faith was genuine.